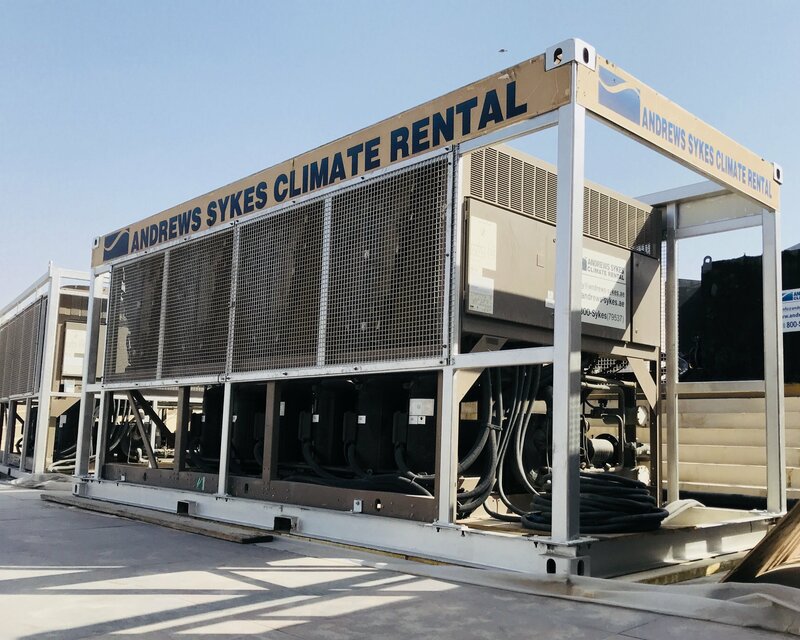 Andrews Sykes Climate Rental were contacted by one of Abu Dhabi’s leading facilities management companies who required an emergency cooling solution for their large laundry facility. The project appeared following the breakdown of their permanent chilled water system, which happened during the peak summer and triggered provision to the replacement of faulty chiller. An expert from Andrews Sykes conducted survey and proposed to install two 682kW air cooled chiller along with one VFD driven 660kW air handler and multiple 100kW portable air handler units. Hire team reacted to the emergency fast and provided the proposed chiller within hours of being called. Andrews Sykes also provided a team of expert engineer and technicians, to ensure uninterrupted cooling and reduce the temperature for the entire facility to a comfort zone. The temporary chillers and air handlers worked perfectly in combatting high temperature and instantly improved working conditions for employees, allowing them to continue working in suitable working conditions. This article was posted in Air conditioning rental, Air Handlers, chiller hire, Chiller Rental, Emergency Air Conditioner, Emergency Cooling, Food Industry, Summer AC Rental, UAE Treated Fresh Air Provider and tagged AC Rental UAE, Air Conditioner Rental, Air Conditioner Rental Dubai, Air conditioner Rental UAE, Chiller Hire, chiller rental dubai, Chiller Rentals, Climate Rental, Comfort Cooling for Summer Events, cooling equipment, Emergency cooling, HVAC Rental, specialist climate control products, temporary climate control. Both comments and trackbacks are closed.